EBSCO's Points of View Reference Center (subscription service) is an excellent resource for students engaged in debate, research, or interested in learning about ideas touched by controversy. The writing and content of this database is geared toward high school students and older. However, there are topics that support middle school curriculum and interest. 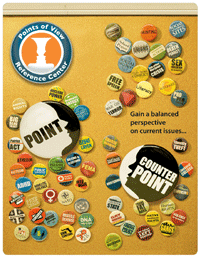 Points of View includes 343 different topics, each with 4 foundational essays (overview, point, counterpoint, and guide to critical analysis). In addition, each topic is associated with hand-picked support documents that include magazines, academic journals, books, radio/tv transcripts, and more. EBSCO has produced a Common Core Standards alignment document, showing how use of this resource supports specific standards. In addition to this general resource individual topics include references to relevant Common Core and state standards. For a brief overview of this resource watch the below tutorial. GTSD staff who would like to know more about how to use EBSCO resources with students or for professional development are invited to contact Mrs. Bond.